"In my opinion, a proper quiche should be rich, custardy, and luxurious--not some kind of dense, baked omelet. This has only enough eggs and yolks to hold things together, but that means you need to let it cool to just warm before serving, to fully enjoy the experience." Cook bacon in a skillet over medium heat until browned and cooked through, 8 to 10 minutes. Remove from pan to drain. Blot out some of the oil from the skillet, leaving 1 to 2 teaspoons. Add leeks, onion, salt, black pepper, and cayenne pepper. Cook and stir until tender and browned, 5 to 7 minutes. Set aside. Sprinkle 1/3 onion-leek mixture on the bottom of the baked crust. Top with 1/3 cooked bacon and 1/3 Gruyere cheese. Ladle in half the egg mixture. Sprinkle with 1/3 the onion-leek mixture, 1/3 bacon, and 1/3 cheese. 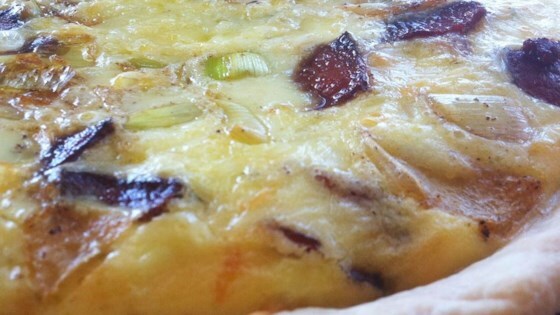 Pour in remaining egg mixture and top with remaining onion-leek mixture, bacon, and cheese. Bake filled quiche in the preheated oven until browned and set, but no longer jiggly in the center, 40 to 45 minutes. Allow to cool slightly before serving.